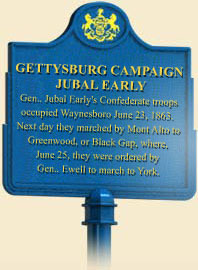 A day after Robert Rodes' division of Richard Ewell's Second Corps, Army of Northern Virginia, crossed the Mason-Dixon Line into Pennsylvania at Greencastle, Jubal Early's division of the same corps crossed into the commonwealth about ten miles to the east, heading for Waynesboro. Marching in the shadow of the western edge of South Mountain, Early's men guarded the eastern flank of the invading Confederate army. Jubal Early certainly was one of General Robert E. Lee's most eccentric commanders. Rude, caustic, and often disrespectful of authority, Early was fond of liquor and women, but had never married. 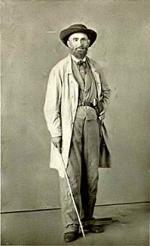 Rheumatism contracted at an early age caused the general to walk stooped over and appear older than he actually was (age forty-six in the summer of 1863). While a student at West Point the Virginia-born Early had gotten into a fight with a classmate who was expelled for breaking a dinner plate over Early's head. Early was permitted to graduate, and then served in Florida against the Seminoles and in the Mexican War before resigning his commission to become a lawyer. Earlier in the Civil War, Early had served under Stonewall Jackson, who, one day, noticed a number of stragglers on the road in the rear of Early's marching column. When Jackson's adjutant sent a short note, inquiring why General Jackson had seen so many stragglers, Early replied as follows: "In answer to your note I would state that I think it is probable that the reason you saw so many of my stragglers on the march today is due to the fact that you rode in the rear of my division." Despite his quirks Early was a good division commander. He started the Gettysburg Campaign with a successful assault on the main Union earthworks at Winchester. His division then forded the Potomac River at Shepherdstown, West Virginia, marched north through Boonsboro, Maryland, and encamped just south of the Pennsylvania border. A cavalry regiment from General Albert Jenkins' brigade sent to scout for Yankees later joined them. Early's men crossed into Pennsylvania on June 23 and halted for the night at Waynesboro. The next day, the division continued north along the mountains, passing through Quincy and Mont Alto to Greenwood (present day Black Gap), a small village on the Chambersburg Pike, now US Route 30. There, Colonel Clement A. Evans, a Georgia colonel in the division, was both amused and surprised at the civilians he met as his men pushed northward. "We find them generally living in pretty good style," he wrote, "but coarse, uneducated, and apparently having little knowledge of the outside world." Evans was also "considerably surprised at the rough and profane language of the Pennsylvania belles. To us who never heard a rough word from the lips of a Southern lady, it sounds very strange to hear these Northern women curse." Early's men camped near Greenwood for two nights and a day. The division included four brigades of veteran soldiers from Georgia, Louisiana, Virginia, and North Carolina. In accordance with General Lee's order, Confederate detachments scoured the countryside, picking up food and forage for his division, which they paid for in Confederate scrip. One Confederate colonel, who had witnessed Yankee theft, vandalism, and destruction in Virginia, did not like Lee's order not to pillage. But, said he, the people "looked so dreadfully scared and talked so humble, that I have invariably endeavored to protect their property and have prevented soldiers from taking chickens, even in the main road." On June 25 Early went to Chambersburg and received orders from Ewell to march his men to the east, through Gettysburg and York to Wrightsville, where he was to tear up the tracks of the Northern Central Railroad and destroy the bridge there. To support Early's division, Ewell added another battalion of cavalry, giving Early one and a half regiments of mounted men. The march east started on June 26. Caledonia Furnace was the first stop. Jubal A. Early, War Memoirs (Bloomington: Indiana University Press), 1960. Nye, Wilbur S. Here Come the Rebels! Baton Rouge: Louisiana State University Press, 1965.